In our old house, a 1920 era Bungalow, we had managed to squeeze an 18” wide dishwasher into the kitchen by removing one of the original 1920s kitchen cabinets. There were only two choices for an 18” wide dishwasher: a low end model made by one of the American appliance companies, and a Miele. Having been delighted with our Miele vacuum cleaner, we decided to go with the Miele dishwasher despite its extravagant cost. 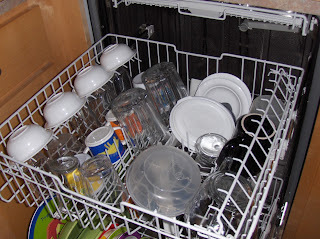 We were thrilled with our dishwasher purchase, especially after having lived without a dishwasher for several years. Like the vacuum cleaner, the Miele dishwasher excelled in every way at washing dishes: everything always came clean, without any rinsing, it was exceptionally quiet, the dishes were dry at the end (without the energy waste of a heating element), and the dishwasher was very energy and water efficient - so much so that we received a nice rebate from the State of Oregon. When we moved into our new house last Fall, we were again faced with purchasing a dishwasher, This time we had more options, because we were looking for a normal 24” width dishwasher. After reading Consumer Reports, we decided to go with the top ranked model: a Bosch. It was still, relatively speaking, an expensive, high end model, but it had received a glowing review by Consumer Reports, and it was less costly than the equivalent Miele. We waited with great anticipation for the new Bosch to arrive and get installed. 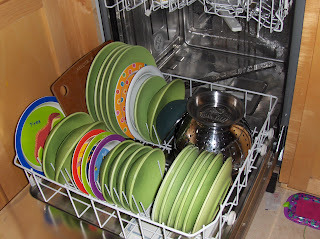 We loaded dishes into it, and washed them, and lo’ and behold, we had sparkly clean dishes. We just didn’t have very many sparkly clean dishes. Strangely, the 24” wide Bosch seemed to hold less dishes than the 18” wide Miele. That didn’t seem like it could be possible, so I figured that I needed more practice loading the Bosch. Well, after a week of practice, I’d had it with the Bosch. Yes, the dishes were definitely clean, but they always came out wet, and even with practice, we still weren’t getting very many dishes in there. much more than two drawer dishwashers. Frustrated with this state of affairs, I checked out prices of the Miele, and called the friendly folks at Standard TV and Appliance to see if I could return the Bosch. Even though the Bosch dishwasher had been installed and in use for several days, they still graciously took it back and refunded our money. I ordered the Miele, and a week later we had the 24” Miele installed. Sure enough, it was clearly obvious that the Miele could hold much, much more than the Bosch. How much can the Miele how? Why can it hold so much more? I took a few photos of our Miele one morning after having run a particularly large load of dishes. You should know that we have three young kids, so we have an abundance of small plates and bowls – way more than adults or older kids would go through in a day. bowls and short glasses on fold down shelves. In short, there were 55 non-utensils items in the dishwasher ranging from a very large colander to very small kids bowls, and 41 utensils. I believe there are three reasons that the Miele can fit so much more. 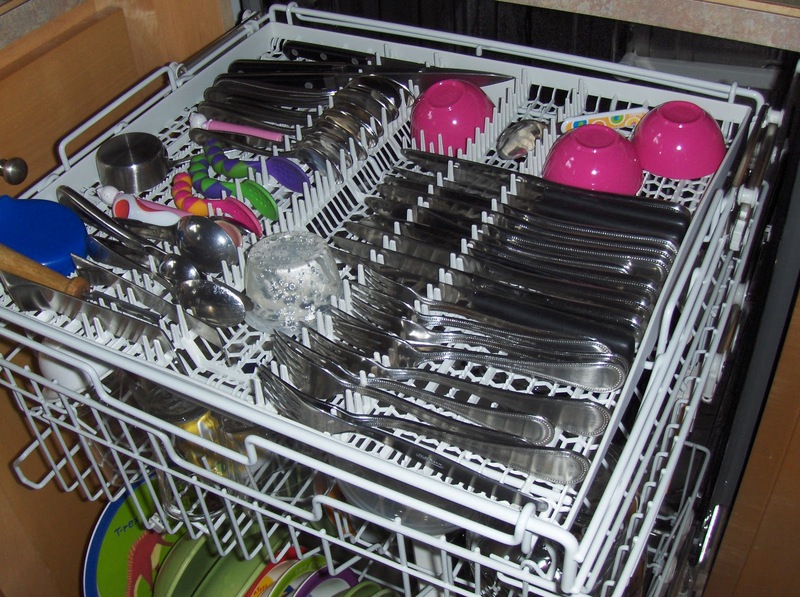 First, the tines that hold plates on the bottom rack are much closer together than on the Bosch, or other ordinary dishwashers. 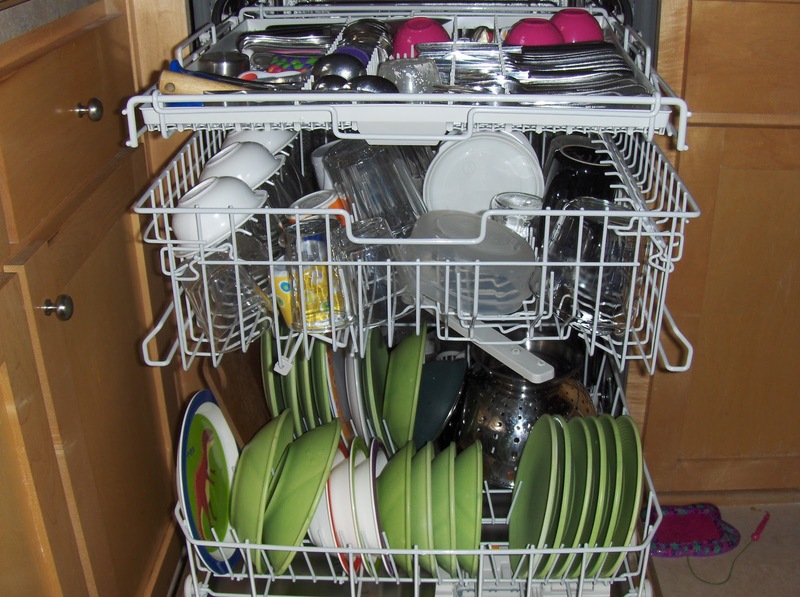 I believe Miele can accomplish this because the dishwasher is so effective at cleaning that it can still get all the dishes perfectly clean even with less room between the plates. 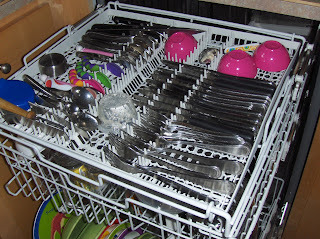 Second, the cutlery goes on a third rack, at the top of the dishwasher, instead of taking up valuable space on the bottom rack. Third, the middle rack has two fold down arms. I think these arms are meant primarily to help hold wine glasses steady when washing those kinds of glasses, so that they don’t rub against each other. But the shelves function equally well for holding small bowls and plastic food storage containers. In fact, they are especially good for the kinds of small plastic items that normally get flipped over during washing and fill with water. When placed on those fold down shelves, the small plastic items are held in place by the cutlery tray, so they don’t move around or flip over. 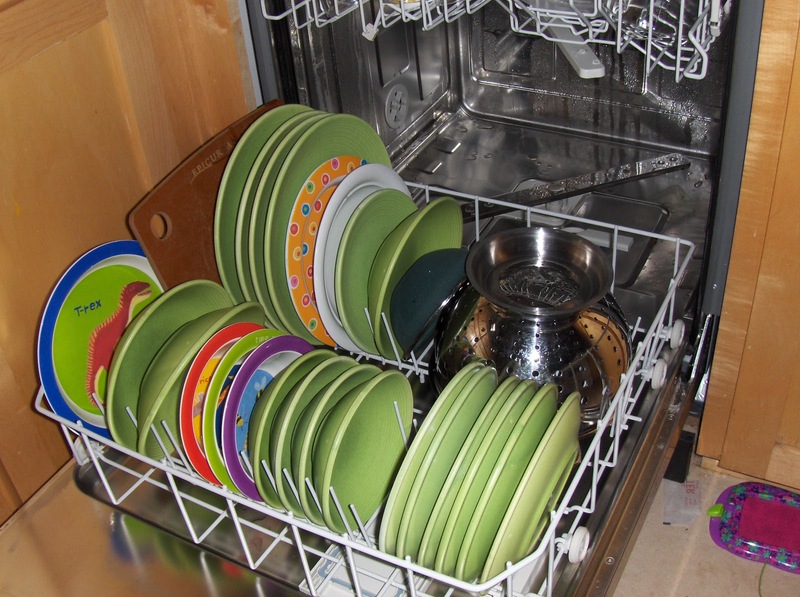 The end result of all this extra capacity is that we can do less dishwasher loads (saving money, water, and energy), as well as be able to fit pots and pans that would otherwise end up having to be hand washed. By comparison, if you take the same number of plates that would fill the Bosch’s space-inefficient bottom rack and put them instead in the Miele’s bottom rack, you’re left with enough room in the Miele for two to three large pots. 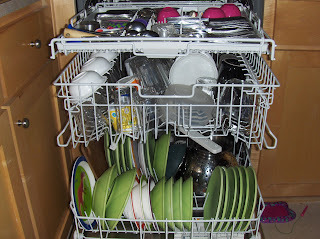 Oh, and the Miele gets all the dishes perfectly clean, and the dishes are dry at the end, and it's very quiet. I highly recommend this dishwasher - as far as I can tell it's the ultimate dishwasher.